Practical sessions are increasingly important for the education at the Faculty of Mathematics and Natural Sciences. For students of many disciplines gaining lab experience is essential for their future careers in science or industry. They have to be able to use the most modern equipment and materials. Therefore, the faculty has established the Tools & Materials Fund, for the purchase of new, advanced equipment and to replace of worn-out facilities. Since 2014 the alumni desk of Ubbo Emmius Fund has been funds via telephone campaigns among alumni for this purpose. During the first telephone fundraising campaign, in 2014, the alumni desk raised € 20,035 for the Tools & Materials Fund. The faculty was able to purchase a Nao Evolution robot for the educational programs of Artificial Intelligence. Due to the humanoid robot, the students learn to master the programming of perception- and behavior control. Thanks to the telephone fundraising campaign in 2014, the Ubbo Emmius Fun got in touch with the foundation PATO (Foundation for Postgraduate Technical Education). In 2015, this foundation decided to make an donation of € 50,000 for the establishment of a model factory for Industrial Engineering students. With this model factory, students learn how to program (industrial) processes and gain experience in an industrial environment and the character of its systems. The model factory is in use since September 2015. The aim is to introduce (especially first year) students to ten central academic and engineering skills, and the model factory mainly focuses on analytical reasoning, simulation (as engineers) and communication. The second telephone fundraising campaign in November 2015 raised € 15,707. With the proceeds of this campaign, the model factory will be extended with a (bio) chemical process environment. In the future, the faculty hopes to further expand the model factory with more modules into a multidisciplinary experimental plant, making it more versatile and useful. The short film shows the model factory in operation. 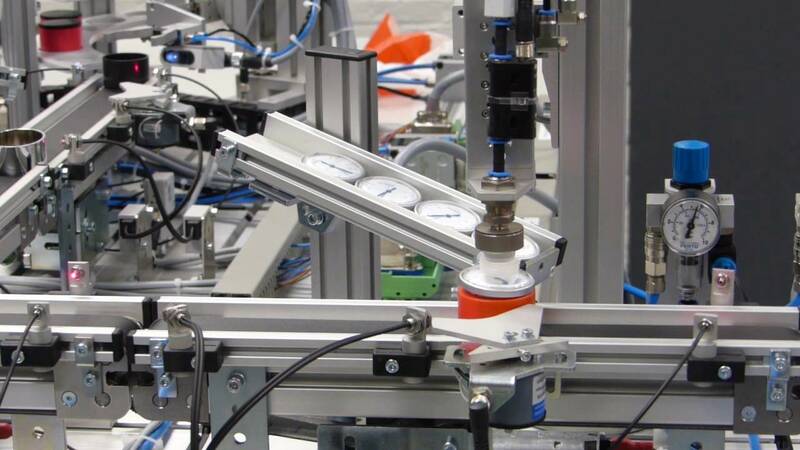 The challenge of the model factory is the control: sensors detect additional product components, where decisions are made for the further steps (product selection, storage or processing steps). For more information about the Tools & Materials fund see the crowdfunding website www.rugsteunt.nl. It is still possible to make a donation via this website. Last modified: 03 April 2019 07.11 a.m.